The protective devices, called Friction Pendulum bearings, were custom made for the statue based on analysis and tests conducted at the University at Buffalo's earthquake engineering laboratory. 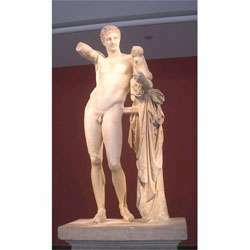 More than 2,000 years old and generally regarded as an original of the famous Greek sculptor Praxiteles, the Hermes statue, located at Archaeological Museum of Olympia in Greece, is one of few works of art in the world equipped with devices to protect it against damage from major earthquakes. "This is sometimes the best strategy for protecting individual artifacts other than seismically isolating an entire museum building, which is a significantly more complex and expensive task," said Michael Constantinou, Ph.D., co-investigator with Andrew Whittaker, Ph.D., both of whom are UB professors of civil, structural and environmental engineering. Constantinou and Whittaker worked with Vlassis Koumousis, Ph.D., of the Technical University in Athens on the analysis of the seismic isolation system for the Hermes statue. The methodology developed by the UB engineers also will allow the Greek Ministry of Culture, which funded the project, to evaluate the potential for seismically isolating other important statues. According to the UB researchers, the Friction Pendulum bearings will allow the Hermes statue to withstand the maximum earthquake forces that can occur in the region, which could register as much as a magnitude of eight on the Richter scale. "Preservation is of paramount importance, since the statue of Hermes represents one of Greece's most important artifacts," said Constantinou. Manufactured by Earthquake Protection Systems of Vallejo, Calif., the Friction Pendulum devices have been extensively tested, analyzed and further developed by UB researchers for seismic protection at several sites, including the International Airport Terminal in San Francisco, giant offshore gas platforms in Russia and the Ataturk Airport Terminal in Istanbul. The devices are designed to allow structures, structural components or even an ancient work of art to swing gently from side to side like a pendulum instead of either breaking or toppling over. Using software developed by UB researchers and following recommendations supplied by Constantinou and Whittaker, researchers at the Technical University in Athens conducted computer simulations to demonstrate how the isolated statue would likely respond during the maximum ground motions likely to occur at the museum site. Based on those simulations, Constantinou and Whittaker then developed specifications for the manufacture and testing of the bearings. The bearings were shipped to UB, where they were tested in the university's bearing testing machine, one of very few in the world that is capable of testing with precision forces down to just 500 pounds, the level used to test the bearings for the Hermes statue. "It's very difficult and challenging to accurately measure such a low level of force," said Constantinou. The machine is part of UB's Structural Engineering and Earthquake Simulation Laboratory, which recently underwent a $21.2 million equipment upgrade, funded by the National Science Foundation, the State University of New York construction fund and UB. From the UB lab, the bearings were shipped to the Archaeological Museum of Olympia, where they were installed below a reinforced concrete base on which the Hermes statue was placed.